As reported in my review of progress on 10the August, I have had a frustrating time with illness since January. The initial problem was a recurrence of inflammatory arthritis. This episode started in my neck but then spread to other joints. My left knee, which has been much less affected than my right knee during previous episodes over the years, bore the main brunt of the attack on this occasion. I was obliged to cut back on running and I abandoned my program of leg strengthening exercises. Then as the arthritis began to resolve I suffered another attack if the debilitating viral illness that I had suffered in the summer last year. In addition, my heart rate recording raised the possibility that I had developed atrial fibrillation. As a consequence of these problems with my health, throughout most of the spring and summer I had done several sessions per week on the elliptical cross trainer, but very little running. Through July and early August I had run around 5 Km each week, all at a low aerobic pace. By the end of the first week of August these health problems had receded into the background, though I was still somewhat troubled by pain on the underside of the patella of my left knee – apparently a consequence of adjustment of my gait in preceding months to minimise pain from my inflamed joint. So with a slight unease about how my knee would cope I recommenced running regularly in the second week of August. I was initially delighted to find that I did not appear to have lost too much aerobic fitness – probably a consequence of the regular elliptical cross training. However after the third day of running I was dismayed by the extent of the aches and pains in my joints and muscles. The chart of my daily recording of heart rate variability tells the story of the way that my body reacted to the stress. Each morning I measure heart rate variability during a two minute period. First I feed the cats to ensure that they do not disturb me with their attention-seeking behaviours, and then I retreat to my study where I record by heart rate while standing quietly, using my Polar RS800CX in R-R mode. I have found that although heart rate is higher and high frequency variability is lower when standing compared with lying down, the day-to-day consistency is greater when standing. During the first week of August my average HR was 50 bpm and RMSSD was in the range 72 to 96 milliseconds with an average value of 84 milliseconds. RMSSD is the root mean square of differences between successive R-R intervals and provides a measurement of parasympathetic activity. The parasympathetic nervous system regulates recovery from stress. For me, RMSSD values in the range 80-90 milliseconds indicate a well-recovered state. Because RMSSD falls off logarithmically as heart rate rises due to stress, it is conventional to plot the natural logarithm of RMSSD over time to monitor the variation of stress over time. Figure 1 shows natural log of RMSSD for the first 29 days of August. In accord with the observation that RMSSD was fairly constant in the range 72 to 96 milliseconds in the first week of August, natural log of RMSSD was fairly constant in the range 4.3 to 4.6. The fluctuation on 6th, 7th and 8th is typical of the day to day fluctuations that reflect normal responses to life’s ordinary stresses. Following my first run, an easy low aerobic 8km run at 6:30 min/Km pace on August 8th, log RMSSD fell noticeably the following morning, but not enough to cause concern, and had recovered well by 10th. Encouraged, I did another low aerobic 8 km run at the slightly faster pace of 5:49 min/Km on that day. For the next few days log RMSSD remained steady around 4.4 despite a moderately busy week at work. On 13th there was a transient downwards blip following a night of greatly reduced sleep, but I had recovered well by the 14th and was looking forward to a week’s holiday in which I planned to gradually build up my training volume, while journeying in relaxed manner up the river Soar from its confluence with the Trent at Redhill to Leicester, with my wife, our son and his girlfriend, on our canal narrow boat. Our boat had lain idle since the winter and the weekend of 15th and 16th was spent getting it ship-shape. Nonetheless I found time for an easy 8Km low aerobic run each day. Unfortunately, keeping a boat in good order requires more time than I usually have, and the list of things to do seemed endless. Monday was a little more hectic as we felt under increasing pressure to complete the essential tasks and set-off before sunset, to ensure that we would awaken to birdsong and other riverside sounds on Tuesday morning. There had been no time to run on Monday, but Tuesday I was able to enjoy a low aerobic run along the river bank. I was a little disconcerted to find that my joints, especially both knees felt uncomfortably stiff. They had not loosened up by 4.5 Km. so I decided that it would be prudent to build up the volume very gradually, with a short run each day. For each of the next few days I did a 5-6km low-aerobic run, at a pace in the range 6-6:30 min/Km. It was a delight to be running beside the river, but I was dismayed to find that the musculo-skeletal aches were growing day-by-day rather than receding. The situation was not helped by the fact that I was spending several hours each day below deck doing various jobs. Maintaining a narrow boat is rather like the composite challenge of maintaining an old motor car and an old house. The primitive diesel engine lacks all of the refinements of a modern car engine, and needs looking after in the same way as was necessary with a car engine in the 1950’s. Similarly, the boat’s domestic arrangements include plumbing, electrical circuits and items of woodwork that are all rather prone to deteriorate when the boat lies neglected and unheated throughout the winter and spring. So while my wife manned the tiller and watched the river glide peacefully by, and my son and his girl-friend operated the lock gates as required, I was contorting my aging frame into odd postures within the cramped space below deck. I was amazed at just how much core strength is required to lean forwards, unsupported, and brace one’s upper body while driving a screw into piece of wood at the back of some scarcely accessible cubby hole. Fortunately a narrow boat on a quiet river does not pitch or roll, though there were some unexpected jolts when the hull bumped against the stonework within the locks. I was not sure how much my musculo skeletal aches and pains were due to the contortions and exertions of below-deck carpentry, and how much was due to the loss of leg conditioning during several months within only minimal running, but whatever the cause, I was aching from head to toe. Overall, our trip to Leicester and back along a river that meanders though leafy middle England, out of earshot of cars and trucks and with little apart from the occasional blue flash of the wings of a darting kingfisher to quicken the pulse, was mainly a time of tranquillity and relaxation. 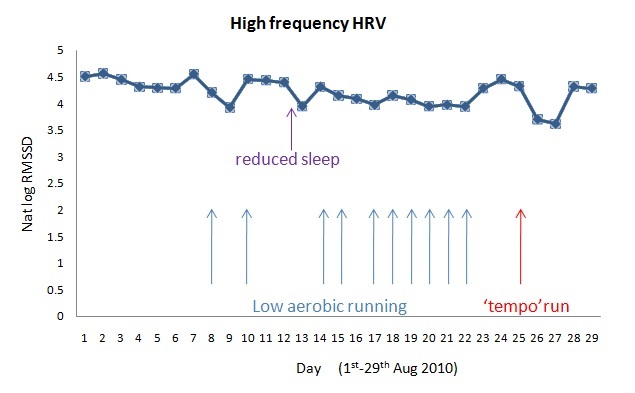 Nonetheless, the daily HRV recording revealed a small but steady downwards drift of log RMSSD. In years gone by I would scarcely have believed that running about 5 km per day at a pace that could best be described as a jog could lead to a gradual accumulation of stress. However, the HRV measurements confirmed the message I was receiving from my aching body. After six consecutive days of low aerobic running during which log RMSSD continued to drift slowly downwards, I decided it was time for some recovery days. As can be seen from the figure, my parasympathetic system bounced back immediately and within a day log RMSSD was back in the range 4.3-4.4, despite my return to work and the associated pressures. Three days later, I decided it was time for a modest tempo run. I set off late in the evening after arriving home from work, with the intention of doing 4km at around 5 min/Km, within a 6Km run. Again, harsh reality confronted me. The aches in my joints were immediately re-awakened and I struggled to maintain a pace of 5 min/Km even for a brief period. The next morning, I was limping due to a recurrence of metatarsalgia in my left foot – a longstanding problem arising from congenital downwards protrusion of the heads of my second metatarsals in both feet, but a problem that has been quiescent for many months. The recording of heart rate variability confirmed that I was quite stressed. Standing heart rate was 56 bpm, RMSSD was down to 40.6 milliseconds and the corresponding value of log RMSSD was 3.7. I refrained from running the next day but the following morning I was still limping and RMSSD was only 3.6. However, after another day of rest, my parasympathetic system re-asserted itself and log RMSSD rose to a healthy 4.3. In summary, my return to running has demonstrated just how much overall fitness I have lost, despite relatively good preservation of aerobic capacity. My heart rate while running is only a few bpm higher than it would have been at similar paces 6 months ago, (typically around 650-700 b/Km), but the aches in my joints demonstrate that my musculo skeletal condition is poor. I have been especially interested to note that log RMSSD appears to provide an indication of overall stress on the body, not just cardiac stress. I suspect that the musculo-skeletal micro-trauma releases a surge of cytokines (molecular messengers that mediate inflammation) into the blood stream signalling to the brain that the body is under stress. However, the good news is that despite the evidence of an inexorable increase in stress during the 6 consecutive days in which I ran 5 or 6 Km at an easy low aerobic pace, and the much sharper rise in stress (that is, a fall in log RMSSD) the day after my attempted tempo run, on both occasions recovery occurred within a day or two. Thus in both of these instances, it is probably accurate to say that I had achieved a level of over-reaching from which recovery was rapid. Perhaps this is a near ideal situation insofar as deliberate over-reaching is probably the most rapid way to increase fitness. However, it is fraught with risk, unless the rise in stress is monitored carefully. I am afraid that I must ruefully acknowledge that as I approach my 65th birthday, a level of activity that I would have shrugged-off as trivial in my younger days, is now enough to produce over-reaching. If it had not been for the measurement of heart rate variability, I would scarcely have believed the message my body was sending me. It appears that my return to fitness will be slow, but provided I monitor the situation carefully I am confident that the trajectory will show an overall upwards trend. It is time for a review of progress. Following several decades in which I did no regular exercise apart from cycling to and from work, I made a brief return to regular running in my late fifties. After running a total of about 300 miles spread over a period of sixteen weeks, I ran a marathon. I started the race with little idea what pace to set, but optimistically settled on a pace around 7:10 per mile (4:30 /Km) and reached the halfway mark in 93 minutes. Not surprisingly considering my inadequate preparation, I hit the wall at around 20 miles and struggled home in 3:27:35. In the subsequent few years I did a little sporadic running. Those years marked the passage from my fifties – that decade of early middle age in which it is possible to remain blithely unaware of the aging process – into my sixties, the decade in which it becomes increasingly hard to ignore the accumulating loss of strength and flexibility. At the beginning of 2007, I began running fairly regularly again. For nearly three years I covered a distance of 15-20 miles per week, mostly at an easy pace. In contrast to my experience during the brief return to running in my late fifties, I no longer found running at 7 minute mile pace (around 4:20 /Km) to be easy. My leg muscles struggled to sustain a stride length much longer than a metre. It was clear that I had to do something about the deterioration of my leg strength if I was ever again to run with any semblance of grace and power. And then other problems emerged. I have been puzzled by some chaotic recording from my heart rate monitor, suggesting possible atrial fibrillation. That issue is not yet fully resolved and I will return to a more detailed account a little later in this post. Then, in early summer I developed a debilitating viral illness similar to the illness I had suffered last summer. Last year my doctor had decided it was chicken pox, despite the evidence that I had had chicken pox as a child, and most people develop immunity after one attack. I had also had an apparently similar episode of illness in my twenties. I have now had a total of four such episodes. Blood tests reveal that my immune system has mounted a good long-term defence against chicken pox – probably a consequence of my childhood episode, and that immune response has been maintained in recent years, so I am very skeptical of the suggestion that the more recent episodes can be chicken pox. More recently, I developed left patello-femoral pain – irritation of the under surface of the knee cap – which was probably a consequence of adjusting my gait to minimize pain from the lingering bout of arthritis, together with loss of strength in my thigh muscles due to the reduced activity. As a result of this series of problems I have not trained systematically for many months. In the past six weeks I managed to run an average of 5Km per week, together with about 2 hours per week on the elliptical cross trainer. Fortunately at this stage, all of these problems have dwindled into the background, though none have disappeared entirely. Two days ago I did an easy 8Km run, at around 6 min/Km pace with no appreciable pain in my knee. I did a similar run today. My average pace was 5:49 min/Km and my average heart rate 118 bpm. While this heart rate is about 5-6 bpm higher than I would have expected at this pace a few months ago, my loss of aerobic fitness has not been catastrophic. As I sit here typing I am aware of a slight pain behind my left patella, but I am reasonably hopeful that the worst of the patello-femoral syndrome is behind me. So I hope I can begin training regularly, though cautiously, again. What are the lessons to be learned from the tribulations of the past 6 months? Despite the multiple mild health problems that have afflicted me since childhood , including mild asthma and arthritis, I am generally a healthy person. Prior to last summer’s mysterious viral illness which kept me off work for a week, and left me debilitated for a month, I had never missed a day’s work in my life. I have almost never required medication. In contrast, during the past year I have been to see the doctor more times than the total number of occasions in the preceding 60 years. I do not think this can be dismissed simply as a consequence of aging. The accumulation of multiple problems, all of which are likely to reflect underlying excessive inflammation, suggests that I am too stressed too much of the time. This can scarcely be due to the running, as I do so little. It is probably mainly attributable to the fact that I can no longer cope so easily with a 60 hour working week, as I did in my younger days. This problem will be resolved by retirement next year, but meanwhile it is crucial that I make sure that my training program does not add appreciably to my level of stress. To monitor my stress level, I measure my heart rate and heart rate variability (HRV) while standing shortly after rising most mornings. My standing pulse is typically around 48-50 and my high frequency heart rate variability (assessed by calculating the quantity known as RMSSD) is typically in the range 60-90 milliseconds, when standing. This indicates a fairly good level of activity in the parasympathetic nervous system – the system that regulates recovery. However when RMSSD drops to 30 millisec I look for additional ways of reducing stress level and do my best to get enough sleep. As a result of the chaotic recordings from my heart rate monitor over the past year, I am still undergoing investigation. On balance, I think that the evidence indicates that I do not have atrial fibrillation (AF). The main reason I believe this is that there have been several occasions when I have had really chaotic recordings which I was able to demonstrate, by adjusting the chest strap, were definitely due to poor electrode contact. On other occasions I have discovered similarly chaotic recordings retrospectively, when I examined the R-R recording after the training session. The most noteworthy feature of these records is that within the wild fluctuations there are discernible periods in which both average heart rate and also heart rate variability persist at a level virtually identical to that before the onset of the chaotic rhythm. If the chaos was due to AF, I doubt that the heart would recover its equilibrium so immediately. However, while I think it is probable that I do not have AF, there are some other features of note. Sometimes there are sharp spikes suggesting premature atrial contractions and on other occasions, missed beats, which might reflect premature ventricular contractions. Premature ventricular contractions would be expected to produce a broad R wave in the ECG, and so might not be detected in the monitor which is designed to identify the normally sharp R waves. As far as I can judge I do not have an excessive number of premature beats compared with a typical 64 year old man, but I regard the frequency of these ectopic beats as a potentially useful indicator of the status of rogue pacemaker sites. As a result of my focus on chaotic rhythms, I have developed increased awareness of the high prevalence of AF in middle aged male endurance athletes. While this awareness is disconcerting, I do not believe ignorance is bliss. The evidence suggests that many middle aged men have rogue pacemaker sites, mainly near the locations where the pulmonary veins enter the left atrium. Furthermore, the onset of AF is frequently associated with disturbance of the balance between the sympathetic and parasympathetic nervous systems. This suggests that rogue pacemakers create a predispositon to AF and disturbance of the autonomic nervous system can precipitate an episode. In endurance athletes, the relevant disturbance is usually an excess of parasympathetic activity. Therefore, my own speculative conclusion is that it is especially important for a middle aged or elderly endurance athlete to avoid the parasympathetic overtraining syndrome. As described above, I record my heart rate and HRV while standing most mornings. Although the most frequent feature of note is a decrease in HRV due to excess stress, the really important sign to watch for is atypical increase in HRV, possibly indicating the more dangerous parasympathetic phase of overtraining. I have also discovered that whenever I am stressed, I tend to exhibit excessive heart rate variability while exercising. In contrast to HRV at rest, which is generally an indicator of good recovery and a healthy heart, a large amount of variability during exercise is not a good sign – it is associated with a higher risk of premature death. Therefore I monitor the evidence of excessive variability during exercise with some interest, though unfortunately the mechanism underlying HRV during exercise remains something of a mystery and there is little published information about how it should be interpreted. Overall, I am fairly confident that careful observation of HRV recordings can provide useful information to allow me to detect possible development of significant problems with heart rhythm. However, I am also well aware that the unreliability of these recordings makes it essential to undergo more reliable investigation by a qualified cardiologist or electrophysiologist before jumping to any conclusions. While I suspect that stress and the associated inflammation have played the major part in the problems with my left knee, the lingering patello-femoral pain re-emphasizes the importance of maintaining adequate strength and flexibility of the muscles and tendons around knee and hip. In particular, weakness of gluteus medius (which allows sagging of the unsupported hip during stance) and weakness of the quadriceps can contribute to poor alignment of the patella on the femur . Therefore, I think it is worthwhile to continue the regular body-weight resistance exercises that I had started last November. Although I am not a strong advocate of vigorous stretching of muscles and tendons, in view of the risk of iliotibial band problems when knee alignment is not perfect, I am also stretching the ITB regularly. In summary, the past six months have been frustrating, but I think I have learned some useful lessons. I am still aiming to run a good marathon in 2012. You are currently browsing the Canute's Efficient Running Site blog archives for August, 2010.